Offer a guarantee. One so generous that it keeps you awake at night. You can’t sleep - you’re being way too generous, and people will take advantage of your good nature. Now make the guarantee even better. Crazy? Here is a man who did just that. James runs the online store Master Parts which sells Porsche and MINI car parts. He spoke with me about how Master Parts’ guarantee boosts customer confidence, decreases buyer’s remorse and increases sales. But we want you to be completely confident that there is no risk in buying from us, so we’re going to make it really simple: If you’ve bought something from us and you’re not completely happy with it for any reason, return it for a full refund, including the cost of returning it. All we ask is that you contact us first so that we can agree on a shipping method back to us. Let’s unpack this guarantee together and learn how to apply it to your business. Customers are not 100% sure that a product is perfect for them until they have held it in their hands. They are fearful that the product won’t fill their need. James read about how this fear can prevent a purchase. His response - counteract that fear by offering a return for any reason. You’ve seen this type of guarantee before. It isn’t unique. Any department store offers the same thing. But James didn’t stop there. James says that he’s had so few returns that he’d be surprised if the total number was higher than five. That’s it. Five out of all the sales he’s made to date. James has always offered an amazing guarantee. So we can’t contrast Master Parts’ sales before and after the guarantee. However, I’ve found one example that suggests a 20% increase in sales with a guarantee. You’ll agree that a 20% increase in sales isn’t a bad test outcome. You’ll be in good company after mastering the art of the guarantee. Advertising greats David Ogilvy, Joe Sugarman and Claude Hopkins can all attribute part of their great fortune to the money back guarantee. But it won’t always be smooth sailing. Each return still hurts even though it is infrequent. James’ secret is to take the returns with a happy face. He says that while you may not get rich from a single transaction, you can become poor if you don’t make a point of making every customer completely happy. And while returns do hurt - not every return is a sad story. A Master Parts customer ordered two related parts - a window regulator and a motor - then returned the part he didn’t use. The customer insisted on paying for postage himself and was completely delighted that the whole returns process was so easy. If you’d like to follow James’ example here are some things to bear in mind. James said that his parts don’t spoil or suffer from being tried on. Knowing that you can re-stock the part makes for better peace of mind for James, but wouldn’t make sense for a wedding cake baker. 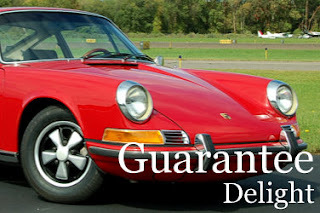 The type and wording of your guarantee will depend on your business. Those selling informational products like an e-book wouldn’t need to ask for return of the product or postage but would still offer a full refund. Brennan, the seller of this e-book about improving your freelance business offers a full refund and a 1 hour consultation. Writing a winning guarantee is impossible without understanding your customer and the nature of your business. James’ customers need to see the part without the fear of being stuck with something they don’t want. Brennan’s customers want to grow their freelance business, so his guarantee addresses that need. Does your guarantee keep you up at night? If you own a Porsche or a MINI or want to say thanks, say hi to James at Master Parts.